There’s plenty of good swimming time left for us hardy Michiganders! 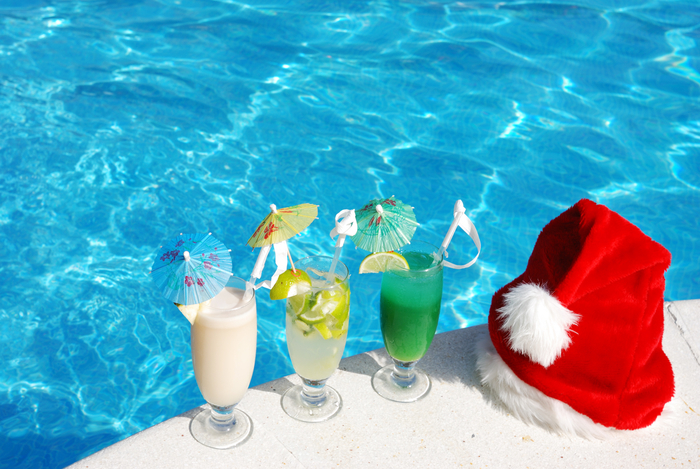 But when it’s time to close your pool be sure to call Clearwater Pools @ 888 533-7060 or 734 669-8990 and get on our swimming pool closing schedule. If you’re a “do it yourselfer” bring in your water sample to make sure your balance is good before adding your closing chemicals. Want to make sure your pool is easier to open next spring? Just add a WinterPill Winterizer. This nifty little product floats under your cover and distributes chemicals long after you’ve closed for the season. Use small pills for pools up to 15,000 gallons and large pills up to 30,000. It also helps Spring openings if you can add chlorine at Thanksgiving and tax day. Call the store for open hours and pick up your chlorine. Make sure your winter cover is in good shape. If your using a mesh cover and it’s old and worn, you’ll be surprised how clear your water is in spring if your replace it. Order a new one from Clearwater. You’ll be happy you did. 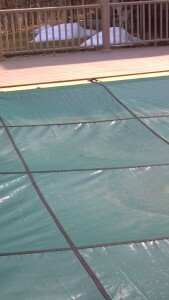 It’s been another long cold winter, but as my pool cover appears I start looking forward to the pool opening. 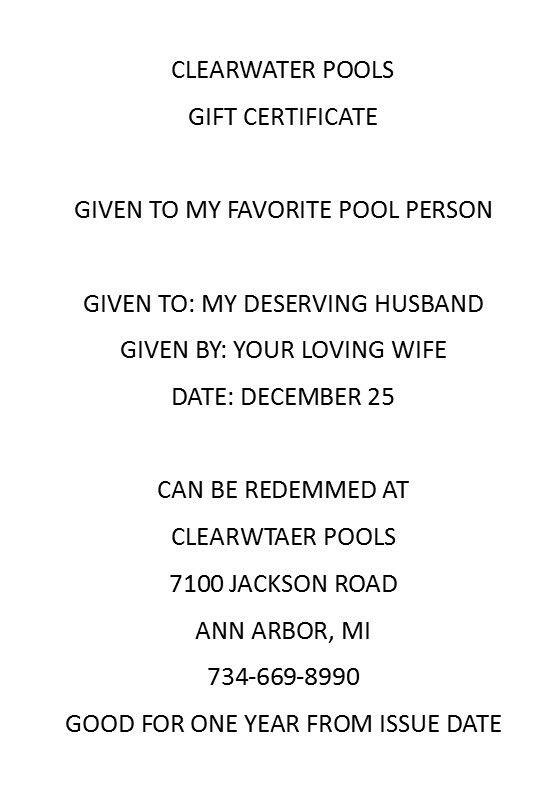 If you’re not already on our pool opening list, now is a great time to call. We’ll make sure your pool is opened properly, all equipment working, PH balanced, pool chemical levels correct, water clear and ready for your family to enjoy. It’s also a good time to check your equipment and pool chemical supplies. Don’t wait until the kids are in the swimming pool to replace those worn out skimmers, cracked hoses, and don’t forget pool toys for the grandchildren. Yes, it won’t be long before we’ll be floating in our pools, sipping a cold beverage, and watching the kids swim. We Still Have Swimming Weather Before We Have To Close Our Pools! It’s August already. Seems like we were just opening our pools and celebrating Memorial Day. Looks like we will have some swimming weather left before we have to close the pool. So visit Gary and the staff at Clearwater Pools to keep the water clear and ready to swim. Our Grandchildren were over last night to swim. I plan to run my new Beluga pool heater and keep the pool open as long as possible. Be sure to get your Beluga at Clearwater. Even though I plan to swim for a few more weeks, I recommend contacting Clearwater and getting on their pool closing list before they are booked up. Proper pool closing helps protect pool equipment and makes opening the pool next spring much easier. 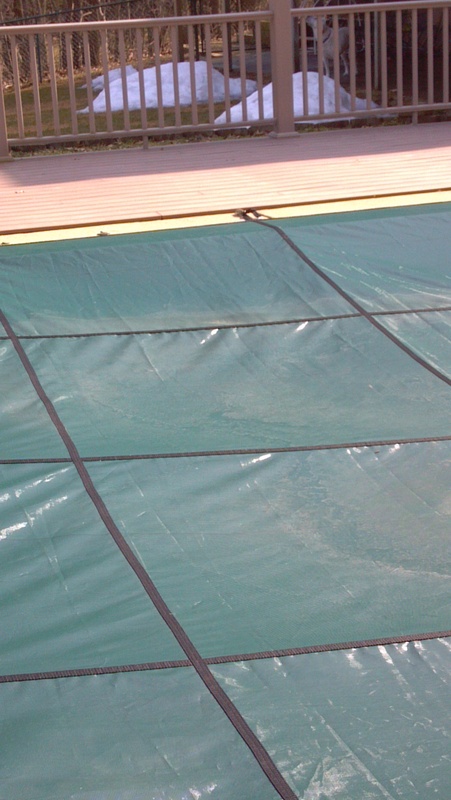 And don’t forget to order a replacement pool cover for the one that got shredded last winter. This is at the top of my list. Hard to close the pool without a cover and mine was totaled by the severe winter we had last season. Enjoy your pool as long as you can. Call Clearwater to help close it properly. 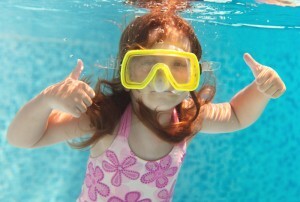 For you “do it yourselfers”, bring in your water samples and see our staff about pool closing kits and chemicals. For those folks who don’t have a pool but are thinking about how nice it would be to have a beautiful swimming pool right outside their door, our crews will still be installing new pools in November. So call today to get on the list. Are You Looking for an Inexpensive, Energy Efficient Swimming Pool Heater? This could be the neatest solar powered pool heater yet. For about $85.00 (Now on sale for $49.99) and a black garden hose, you can add 5 – 10 degrees to your pool water’s temperature. That’s helpful here in Michigan. The Beluga solar pool heater is a simple device that directs your pool water through a hose (heated by the sun) and back into your swimming pool. Combined with your solar cover, the Beluga solar pool heater can help get the kids into the pool earlier in the season and keep pool water warmer adding weeks to your pool season. Check out the Beluga next time you’re at Clearwater Pools in Ann Arbor or call 888 533-7060 for more information. Hard to believe it’s August already. Seems like we were just opening our pools and celebrating Memorial Day. Like the traditional opening of the swimming pool, how we close our pools is just as important. The first thing we do in our household is to let our children and grandchildren know when we plan to close the pool for the winter. 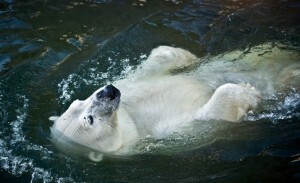 This gives them a chance to get plenty of swim time in before we winterize the swimming pool. Most years we close our pool the weekend after Labor Day. But, because we also have a hot tub near our pool, I sometimes leave it open and swim until October. I call it my “Swedish dip” approach. The only problem with this approach is those years when October turns colder than usual. Suffice it to say, if you have to wear mittens while closing your pool, you’ve waited a bit too long. How you close your pool has a lot to do with how easy it is to open it next spring. You can call us and schedule a Clearwater Pools pool closing appointment to make sure everything is winterized and will be ready when it’s time to open next spring. Or you can stop by the store and check out our Swimming Pool Winterizing kits and the variety of Bio Guard chemicals designed to keep your pool clean. Be sure to bring a water sample. It’s important that your water is chemically balanced before adding the winterizing chemicals and closing for the season. For those folks who don’t have a pool but are thinking about how nice it would be to have a beautiful swimming pool right outside their door, our crews will still be installing new pools in November. 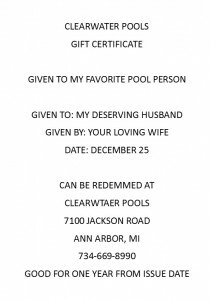 So call today to get on the list and be ready to enjoy your pool next spring. It’s been an interesting summer for our pools. It’s hot and humid one week and cold and rainy the next. Still our children and grandchildren want to swim! So how do we keep our pool water clean and sanitary? 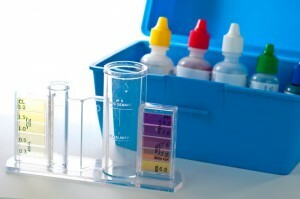 Bring a water sample from your pool or spa/hot tub in and we’ll analyze it for free. Our staff can help you keep a healthy and clear chemical balance in you pool and spa. We will also offer some time and money saving tips so you have more time to enjoy your pool. Visit us soon.